Lower your advertising costs. Uncover new audience segments. Reap the benefits. Any successful advertising campaign relies on delivering your message to a highly targeted audience. Your goal is to maximize the efficiency of your ad spending, and if you’re like most marketers, you need as much detail about your customers as you can get, including what they’re interested in, their spending habits, education, and financial preferences. With Facebook’s Audience Insights tool you can peel away layer upon layer of your target audience to better understand all these things and much more. As Facebook expands their advertising platform to include much more detailed information from a variety of sources, advertisers can create audience parameters like “former miltary personnel who live in a sub-$100k house with 4 other people” or “Divorced women who like to travel, drive a BMW, and shop at high-end department stores” or “men between ages 25 and 45 who buy golf clubs, like Golf Digest, and have a high amount of disposable income”. Let’s rewind and start with a basic example. Assume you want to target folks who like Wine Enthusiast Magazine. Type that into the “Additional interests” field, and voila, you’ll find that 68% of their fans are women and 32% are men. Right away you know that your ad should cater toward women, and you may decide it’s worth crafting a unique campaign targeting only females age 25 to 55. And that’s just the tip of the information iceberg. Your customers or mailing list members: Just upload a list of customer emails or phone numbers and create a custom audience. Your Facebook fan page, or any other custom audience you have created to get a profile. Everyone on Facebook. This option allows you to combine demographics, interests and other qualifiers to get ad hoc information on a certain cross-section of people. Good question. Much of it comes from our own self-reported information, relationship status updates, job titles, education, etc. The majority comes from data-mining companies like Acxiom, Epsilon and Datalogix, who provide key details about consumer spending habits, retail activity, purchase behavior, home ownership and much more. In the above image you might notice the “67% of audience matched” note. Facebook uses the data supplied to them to match against user IDs, so you typically won’t find 100% of people. Not everybody uses Facebook, or their account might use a different name or email. Demographics: This includes age and gender breakdowns, and affinity toward certain lifestyle categories like “hard charger” and “urban tenants” or “solo and stable”. Hover over each one to get a description. For example, “solo and stable” indicates single homeowners who have a stable income and living situation. 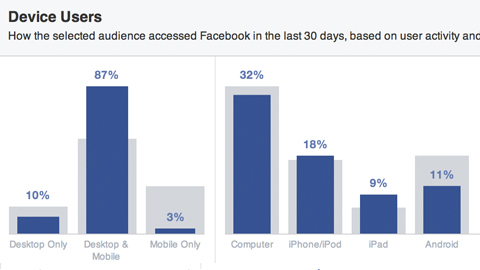 On the right you’ll see how your audience compares to the entire Facebook audience for each category. Page Likes: This is a great section because it shows you other categories and pages your audience might favor. So with “Wine Enthusiast Magazine” we find an affinity toward Justin Vineyards, Wine Spectator, and Paso Robles Wine. You can add these additional findings in the “interests” field to further expand your target audience. Location: Where does your audience live? If they tend to congregate in a particular state or country you’ll find that here. You’ll also find information about languages spoken here. Activity: This section is one of my favorites, and deals with the audience activity on Facebook, showing their ratio of pages liked, comments and shares as compared to the average Facebook user. Suppose you wanted to push a viral piece of news. You would look for an audience that has a higher ratio of ads clicked, pages liked, or posts shared and use that as an indicator as to whether the audience might have a higher tendency to engage with and share content. From here you can also learn about the devices they use, whether they favor a desktop computer or laptop, Android phone or an Apple device, another very useful thing to know when it comes to deciding your ad placement. You may discover that very few people use desktop computers, opting instead for mobile devices, in which case you probably don’t want to waste money displaying ads on desktop. Household: This tab offers insight into home ownership, household size, household income and home market value, all of which could be very useful if you were a real-estate professional for example. Purchase: Perhaps one of the more useful sections in the tool provides information on purchase behavior, retail spending habits, and retail categories. They even offer sugestions on whether or not the audience is in the market for a vehicle and if so, what sort they might prefer, from a luxury SUV to a hybrid or a sports car. From here you can mix and match certain behaviors, demographics, interests and other pieces of data to build a highly targeted audience. Finally, you can save the results as a new custom audience once you’re satisfied, or immediately create an ad targeting the group of people you just sussed out. In case you want to get a more complete idea of how to use Audience Insights, I created this video walk-through of the tool. Of course, as more companies mine data from our activities and share it with whoever’s willing to pay, a certain amount of wariness begins to emerge from the consumer side of things. In a way it’s creepy to see an ad in your timeline that seems like it was made just for you. Axciom even pulled back the curtain a bit in late 2013, revealing how they find and use data on consumers, and inviting anyone to use their website to try it out. As a marketer, you can imagine how powerful this sort of data can be. We can use Facebook’s advertising tool to pin down a specific audience and but to discover similar groups of people on the largest social network. Spend a little time digging around and you could completely transform a marketing campaign, resulting in lower ad spending, higher CTR, and better conversion rates.